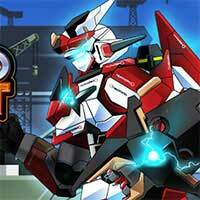 Epic Robot Fight Build and assemble your own giant robot for battle in Epic Robot Fight. Each robot has a myriad of different body parts and accessories that you must fit together to create a working machine. Once you have created your robot you can then progress into the story mode. Complete a variety of battle and earn rewards and cash – you can use these rewards and money to upgrade your robot. You can learn new skills and moves, and upgrade existing skills to improve their power. Furthermore you can improve your robots armor and stats. During each battle you must use your skills by pressing the corresponding keyboard number – once you have activated a skill you must click a series of objects to improve its power. As you progress the enemies become increasingly difficult and tough. Enjoy it on Creetor.